The Southwold Gas Light Company was founded in March 1848 on land owned by the Borough of Southwold. The brains behind this innovative undertaking was engineer George Edmund Child of No 9 Market Place who is credited with inventing the 'gasometer' which would later become a feature of every major town in the country. Child's first Gasometer was 26 ft 3 ins across but larger ones were later built off Blyth Road. 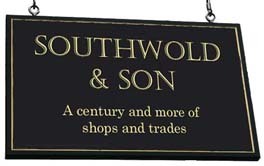 Southwold's first gas street lamps were in operation by September 1848. J H Elmy - Manager, Southwold Gas Light Company. Thomas Henry Jellicoe - Company Secretary (K1896). Southwold Gas Light Company Ltd - The company attains Limited Liability status this year. The old premises are replaced by modern offices and a gas showroom at a cost of £1,600. 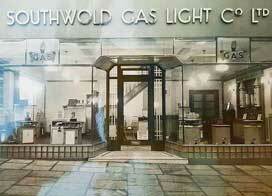 The Southwold Gas Light Company celebrates its centenary. It now serves nearly 12,000 consumers in Southwold and Reydon. But this year also sees the Nationalisation of the British Gas Industry. The works now comes under the control of the Eastern Gas Board within the British Gas Co. Soon afterwards, the works closes. The Gas Works buildings are demolished and redeveloped by Southwold Borough Council who construct 18 warden-managed apartments for elderly residents on the site at a cost of £65,568. The development is named 'Crick Court' in tribute to George Crick. 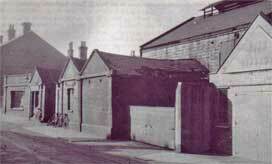 Southwold Gas Works pre 1938. On the right is the fire station. Reproduced from the late Barrett Jenkins' book 'Bygones and Characters of Old Southwold' by kind permission of his daughter, Ann Thornton. The impressive new Art Deco style showroom opened in 1938. This may be a publicity shot..